A late penalty from Leighton Baines earned Everton a point after Wigan Athletic threatened to dent their outstanding start to the season. Everton started the game in second place in the Premier League but only got to grips with Wigan's intensity in the second half to get the draw their pressure ultimately deserved. Arouna Kone looked suspiciously offside as he gave Wigan an early lead but the prolific Nikica Jelavic headed Everton level within seconds. Franco Di Santo restored Wigan's advantage before the interval - and Baines ensured the points were shared with his former club from the spot three minutes from time after Maynor Figueroa brought down Kevin Mirallas. Everton manager David Moyes will settle for the point after being behind for so long and will have been satisfied with the battling qualities shown by his players. But this was not the fluent Everton that have risen so high in the table and credit must go to Wigan as they fought ferociously, taking the game to the Merseysiders in the first half before they were eventually pushed so far back that they were punished in the dying minutes. The Toffees also had a succession of penalty appeals ignored by referee Kevin Friend before finally being awarded the late spot kick from which Baines scored their second equaliser. Everton were unchanged after their fine opening to the campaign - but they carried an air of complacency until picking up the pace as half-time approached. "David Moyes might just have a word to say to the referee, while Wigan will be disappointed, having led twice and led for so long, that they didn't take maximum points. Everton will be upset their mini-winning run is over. There were four goals but lots more than the goals to talk about." Wigan were determined not to let Everton settle, particularly Marouane Fellaini, and the pace of Kone was utilised as he troubled John Heitinga whenever he was able to isolate the Netherlands defender. It was Kone who put Wigan ahead, turning in at close range after Shaun Maloney escaped from Everton defender Seamus Coleman. Everton instantly protested and replays suggested that the striker was offside when he converted the chance. Everton were level just 72 seconds later and the source was no surprise. Steven Pienaar's wayward shot turned into an inviting cross for the predatory Jelavic to head in at the far post. For all the expansive style Everton have shown this season, they looked horribly vulnerable at the back and Wigan regained their lead midway through the first half. Di Santo had already tested Everton keeper Tim Howard from long range and he made no mistake from 12 yards after Kone once again got away from Heitinga. Everton did show signs of life as Ali Al Habsi saved superbly from Leon Osman's deflected shot and Mirallas fired just wide after another effort from 20 yards took a touch off a Wigan defender. The half ended with Wigan fans demanding the dismissal of Fellaini - who had earlier swung a kick at Gary Caldwell in the area - after he floored Figueroa in an aerial challenge. Wigan players and manager Roberto Martinez protested that the Belgian had used his elbow but referee Friend showed the yellow card. Moyes put Heitinga out of his misery by replacing him with Sylvain Distin for the start of the second half. He also made the tactical adjustment of pushing Mirallas alongside Jelavic. And the lively young Belgium forward almost made it work twice as he shot just over then forced a fine low save from Al Habsi as Everton applied more pressure than they had previously done. Wigan were adopting a direct style to test Everton and it needed a superb saving tackle from Phil Jagielka to stop Kone adding a second before Pienaar's shot was pushed away by Al Habsi. Just as Wigan looked to have survived for a victory, Mirallas fell under a challenge from Figueroa and Baines lashed the penalty high past Al Habsi. It was a fitting reward for the outstanding Baines, who struck the post in the first half, but Maloney's deflected shot was only inches away from snatching victory in stoppage time in a rousing finale to a frenetic encounter. "It was a very good performance. When you play against this Everton side you're really going to be tested to the full. I'm really pleased with the amount of opportunities we created, in the first half I thought we were superior. "I haven't seen [the penalty decision] again. But it seemed from where I was that there was a slight contact. I haven't seen it well enough to comment, but it looked as though it was a penalty live. "We managed to stop Everton being a real threat and the amount of chances we created against this Everton side showed how good we are." "It was a hard-earned point - we worked really hard to get back in to the game. We didn't start well, but Wigan did. "We kept at it and deserved to get a goal back. I thought we had another penalty shout with Nikica Jelavic in the second half which should have been given. 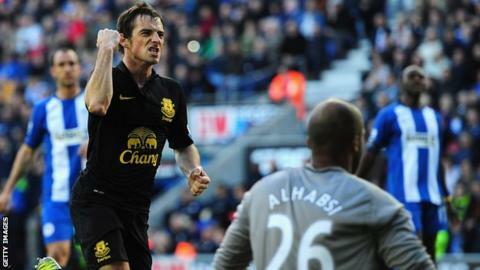 "Leighton Baines was outstanding today. At times he was unplayable he was that good."